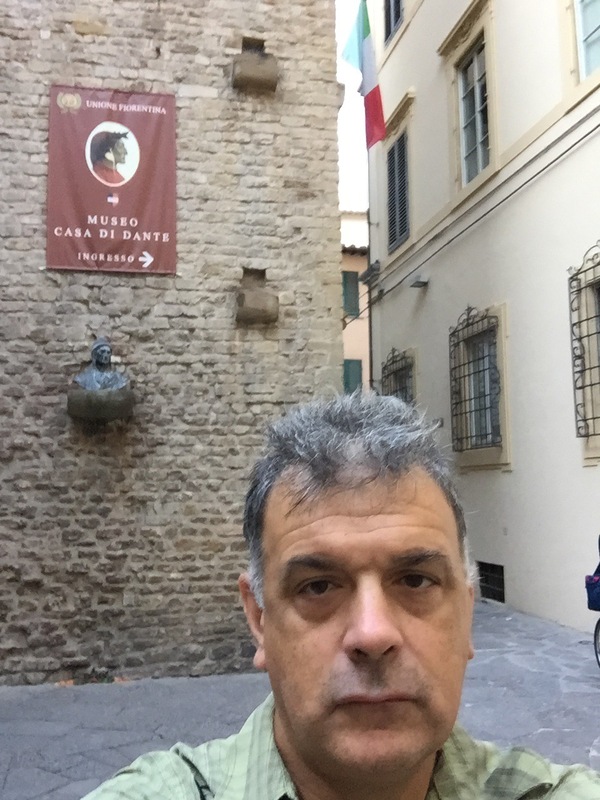 … was not Dante’s house, although I admired that it was on Via Dante Aligheri, and appreciated that the quotations from the Commedia carved in stone and set into the nearby buildings. Inside the Casa is a Museo that, at 4 euros for entrance, cost 4 euros too much. Mostly posters with ots of text in Italian about obscure matters. Some reproduced florins spilling out of a “leather” purse. 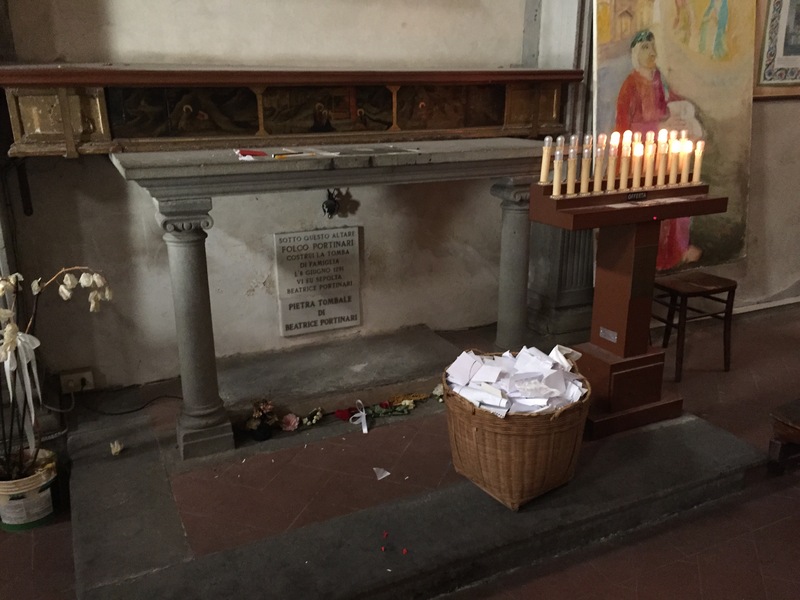 Nor was the most Dantean thing the nearby church of Santa Margerita, “Dante’s Church,” where Dante married Gemma di Manetto Donati, and first saw Beatrice. Maybe. 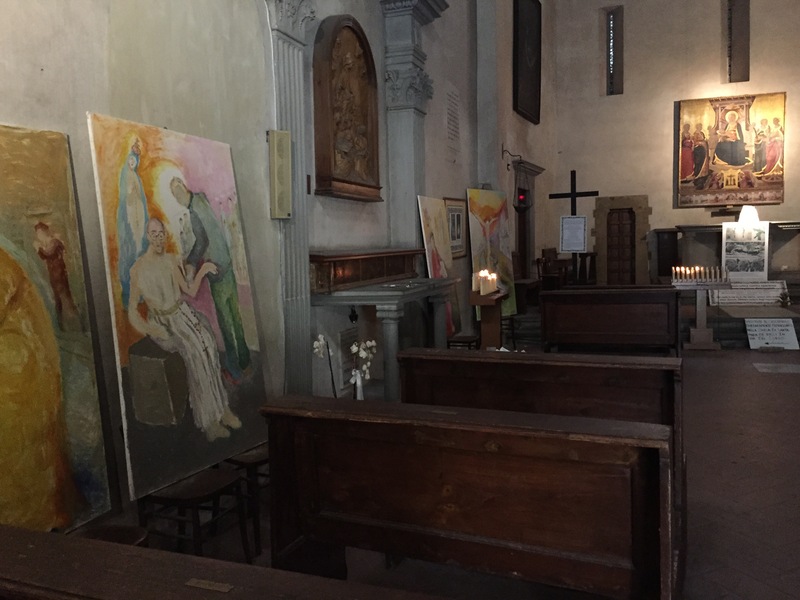 Inside, it’s probably the least church-like church in Florence: many contemporary paintings– bad ones– of Dante looking at Beatrice. Music was being piped in, and not historically appropriate music, such as Gregorian chant, or even particularly religious music, just some weird “beautiful” elevator music. There was a crypt that may or may not have contained Beatrice’s mortal remains. Certainly it belonged to the Portinari family. Above is a shrine to Mary, and in front many hand-written supplications, though to which lafy it is not clear (I didn’t look at any). 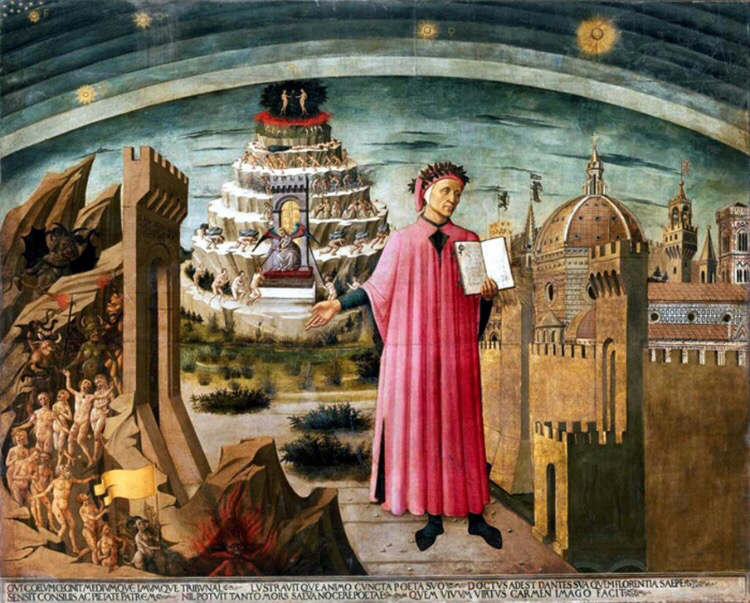 The most famous image of Dante in Florence is the painting by Domenico di Michelino (1417–1491) in the western wall of Florence’s Duomo of Dante holding the Comedy to instruct Florence with Hell, Paradise, and Heaven represented. 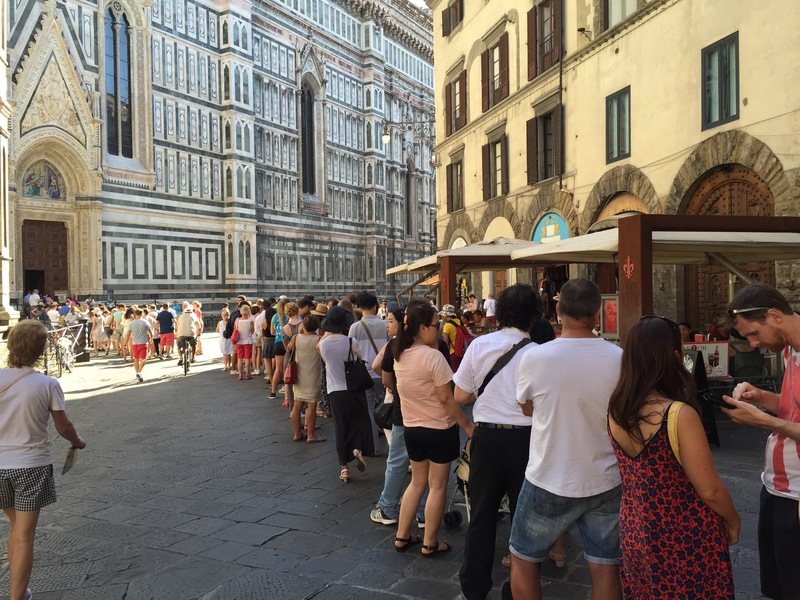 Now the picture below is NOT mine, as i did not go into the Duomo on this trip, on account of the lines. 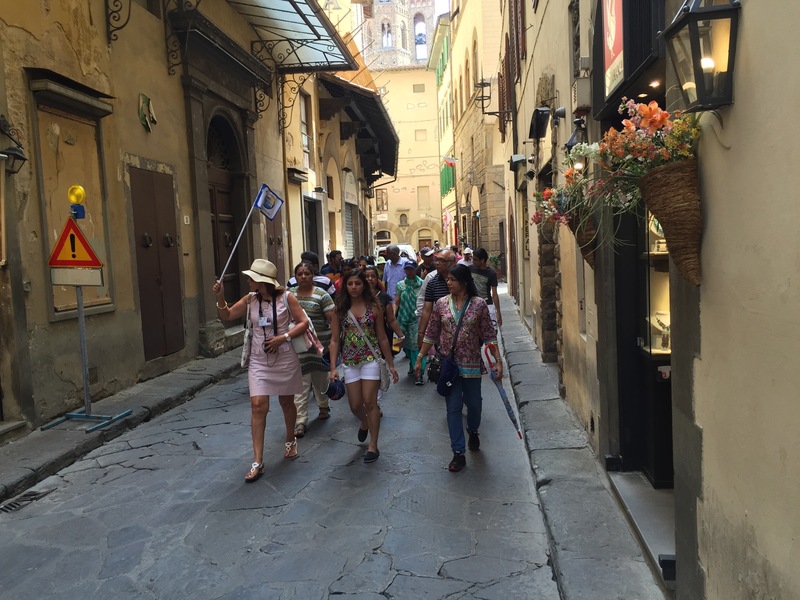 What I did do at the Duomo, and the Piazza dei Signoria, and San Lorenzo, and everywhere else the guidebooks recommend you should go, is watch vast hordes of tourists being rushed from site to site by group leaders with flags, like the souls before the Gates of Hell. 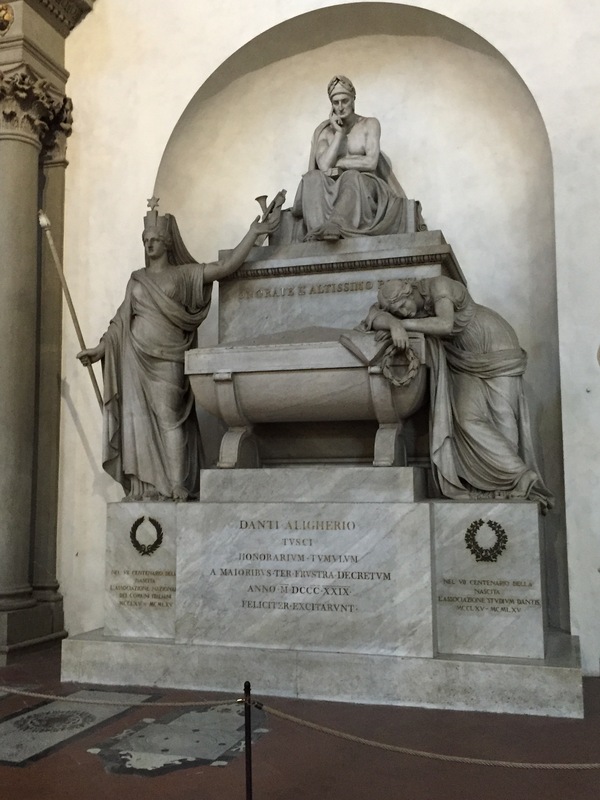 And that, even more than the cenotaph in Santa Croce below, was the most Dantean thing I saw in Florence. 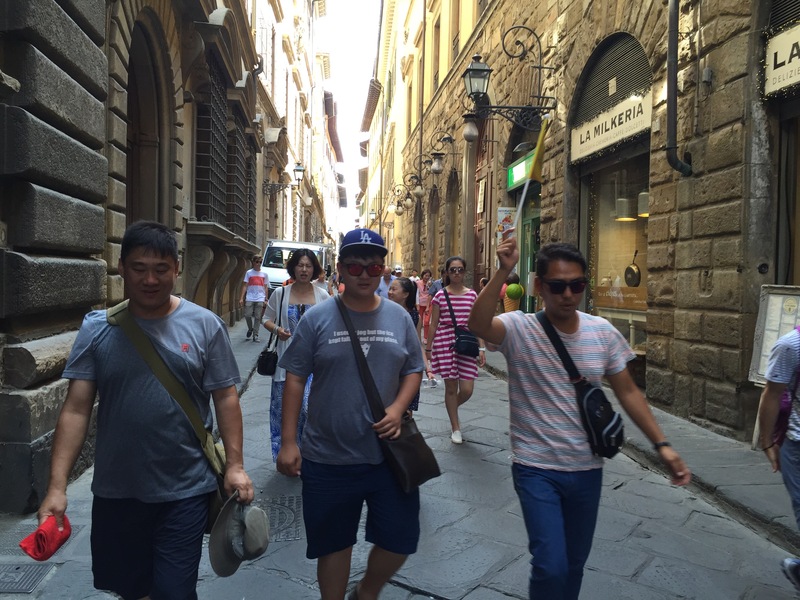 This entry was posted in Bible, Florence, Italy, Music, Poetry, Saints, Statues & Monuments, Time, Uncategorized. Bookmark the permalink.